7 of the day’s top 13 spots went to COLLEGE FOOTBALL on ESPN, Fox Sports 1 and ESPN2, with ESPN’s 10PM (eastern) game topping the night at 0.94. 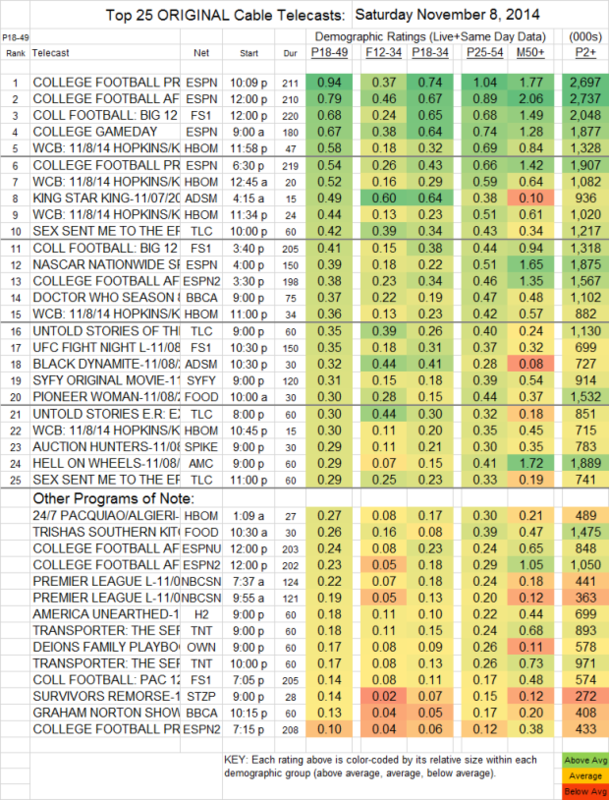 HBO’s WCB boxing was at 0.58/0.52/0.36, and ESPN’s NASCAR race was at 0.39. The top non-sports original was Adult Swim’s KING STAR KING at 0.49, despite the fact that it aired at 4:15AM, considerably above the 0.32 (down 0.12) for the 10:30PM BLACK DYNAMITE. The DOCTOR WHO season finale (BBCAmerica) was up 0.07 to 0.37. AMC’s HELL ON WHEELS, recently renewed for a final “5th season” (which in typical AMC fashion will air over 2 years), returned after a month off the air at 0.29. THE TRANSPORTER (TNT) was at 0.18/0.17, down close to a tenth from last week. On Starz, the season finale of SURVIVOR’S REMORSE climbed 0.06 to 0.14, and the season finale of THE CHAIR was technically at 0.00, although pushing to the next decimal it hit 0.004, with 12,000 total viewers. In response to other reader queries: on Nickelodeon, THUNDERMANS was at 0.26 with 2.06M total viewers, NICKY, RICKY, DICKY & DAWN at 0.22/1.66M, HAUNTED HATHAWAYS at 0.22/1.90M, and HENRY DANGER at 0.20/1.66M. THE KITCHEN was at 0.21/1.36M.